February is my favorite month of the year. Yes, you guessed it right. My birthday falls in this month. But there is more to it. February starts with our wedding anniversary, Valentine’s Day (as if I celebrate! ), my sister’s birthday and then mine. Followed by Dad’s birthday and husband’s birthday in March. It’s true that we do not have anything else to look forward to the entire year. So we make sure to celebrate these two months in pomp and splendor every single year. February brings about a freshness and unique energy in me. I find myself ecstatic and overjoyed. I’d be turning 29 this time and believe me it is overwhelming. Ha, the last year before turning 30! How did these 29 years happen? How did it just go by? I wonder. I don’t easily get addicted to TV series. But with all my might I decided to watch GoT just to know what all the hype was about. And then, there was no looking back. I remember that day when I asked my husband to watch just one episode with me. It took a lot of effort, I tell you. He had come to visit me for a couple of days when I was away for work. I had to leave early the next day to office and then, when I came back home, I found him sitting right there, eyes glued to the laptop, having finished two seasons in a row. Whoa! Then I knew…. GoT has got another huge fan. All our discussions started or ended with Jon Snow and Daenerys Stormborn since then! Crazy! Well, I know reading the books is going to be an entirely different experience. And I’ve been eyeing this box set since long. Even when the sales dipped to 1990 bucks, I didn’t buy it. Because guess what! I wanted to wait till George R. R. Martin completed the series. Alas! I think that’s not going to happen anytime soon. I should’ve said Enrique concert. But let’s get realistic. With travel and food blogging on the cards, I would love to enroll for a photography course. This is something out of pure passion. I’m so looking forward to so many new beginnings this year, in every aspect of my life. There has been many obstacles in my path and I never knew if I could find the strength to move on. I could no longer find a reason to continue. Many a times, I blamed myself for things that went wrong. Then one fine day I let that thought sink in- that I was making a big fool out of myself and I ought to laugh the whole thing off. Yes, I decided to forgive myself. Thus said, I’ve taken baby steps which would once and for all, release me from my past regrets and the worries about some if-onlys and what-ifs. What’d you like for your birthday? Let me know! 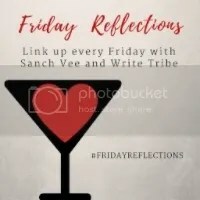 Linking the post to Friday Reflections by Write Tribe and Sanch. I too started watching it just to see what the hype was all about.. at first I couldn’t stomach all the violence… but then probably I got desensitized 😉 now I stay up late reading all the GOT related memes . I wish you and awesome new year, filled with love and happiness. May you find loads of happiness and peace in the year to come and all that you wish for on your birthday, Shalini! As for my birthday, it’s still a long way ahead – June. And, I have at least 6 months to think what I would like for my birthday! 🙂 Till then I am just going to concentrate on making every day as happy as my birthday by not looking back but focusing on my goals. I would say, fulfilling my goals will be the best birthday gift ever! What a wonderful, bubbly post! What do I want for my birthday? Well, I would have to wait for a while because my birthday is at the end of September! But that’s OK. I’m feeling a little greedy right now! I’d love to have a camera with a macro lens so I can take great pictures of insects (I love bugs!). I can’t think of anything else but that’s OK… my birthday isn’t for another nine months! I hope that you have the best birthday ever!!! Enjoy! Beautiful post. Nice wishes. Wish from heart your wishes should get fulfilled. I plan to enroll photography courses too and wish to start writing blogs again from new year.